Testing season is here! And along with the pressures of the test, and managing the testing schedules, and trying to fit in your instruction along with testing, you have to keep track of all of the accommodations! Excel to the rescue! I create a spreadsheet of my students by homeroom. (Each homeroom gets a page in my workbook. Then I label each column with the available accommodation for the state test. I simply type in my student names and put an x in the box for which accommodations they receive. I print a copy for each homeroom teacher and our school assessment coordinator, so she can added the supports to the online testing program. It's a quick way to keep track for everyone! And, as I often have the same kids each year, I can just edit as needed. I use this same concept to tract daily accommodations and accommodations for my students too! 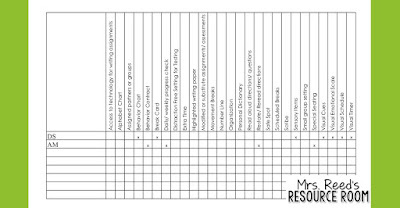 Again, each homeroom gets their own page in the workbook, and I just label each column with the accommodations or modifications needed. 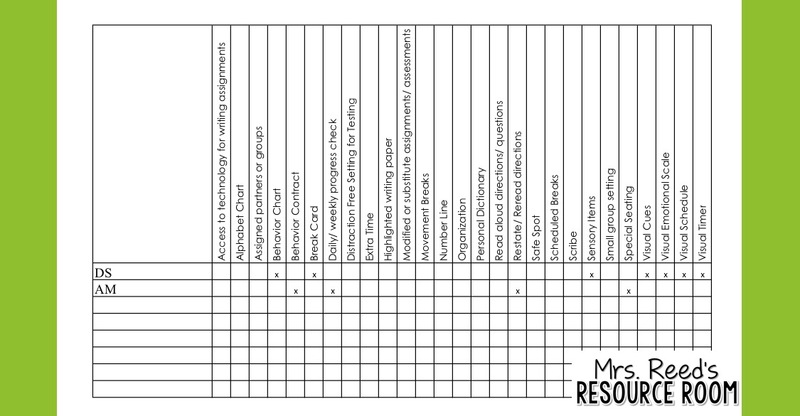 It's easy to share with teachers and therapists so we all keep track of what the students need to be successful. 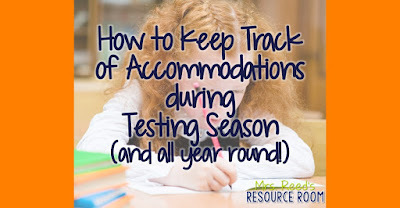 How do you stay on top of accommodations during testing? Check out the rest of the Special Ed Speaks Posts! © Mrs. Reed's Resource Room. Blog Design by RachBV Design. Template by Georgia Lou Studios. All rights reserved.